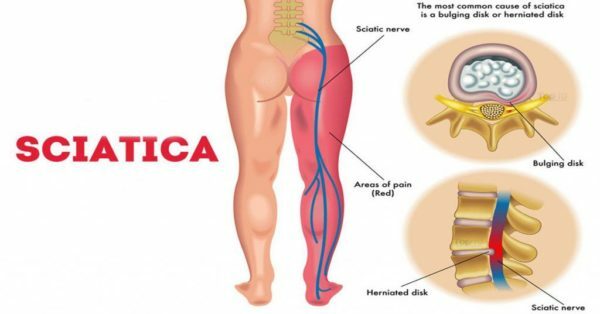 Sciatica refers to the pain that radiates along the sciatic nerve, which branches off from the lower back and travels through the hip and buttocks and down each leg. Sciatica (pronounced as sigh-at-eh-kah) is not actually a medical diagnosis or a disease, it is a symptom of an underlying condition. It describes the symptoms of pain in the leg, including numbness, tingling or weakness, usually at the back of the leg where the sciatic nerve is present. A pinched nerve on the other hand, may result in sciatic pain. As the name suggests, a pinched nerve is a nerve that has been compressed or ‘pinched’ at some point along its path. The location of the compressed part of the nerve will determine what kind of symptoms result. This is the largest nerve in our body. It carries various nerve roots, which start at the spine and branch out in the lower back. They then combine to form the sciatic nerve. This large nerve begins at the level of L3 (or lumber segment 3) of the spine in the back. The nerve then runs from the lower back, through the buttock and travels down the back of each leg. Various nerve fibers branch out into the leg, innervating the thigh, calf, foot and toes along the way. Some other things that can worsen the back pain include being obese or overweight, lack of regular exercise, wearing high heels, sleeping on a mattress that is either too soft or too hard. Age. As we age, various changes occur in our whole body. Changes in the spine may involve herniated discs and bone spurs. These are the most common causes of sciatic pain. Being overweight. Lack of exercise and obesity increases the stress on the spine and can make a person prone to sciatica. Occupation. Work that involves carrying heavy loads or prolonged sitting may also contribute to changes in the spine. This condition may increase the risk of nerve damage. The main feature of sciatica is constant pain in the leg, usually on one side. Pain in both the legs rarely occurs. The pain extends from the buttock down the leg and goes down till the foot and toes. The pain is very sharp, burning or piercing. Pain is worse on sitting, or may make it difficult to stand up or walk. Weakness, tingling or numbness on moving the leg, foot or toes. The pain may be severe and constant, or not very frequent and just somewhat irritating. This depends on the location where the nerve is pinched. Most of these symptoms occur when the Sciatic nerve is compressed or pinched near its point of origin. Sciatic pain rarely develops in young people. It occurs more commonly around the age of 40-50 years. As this term is generally used to refer to any pain in the leg and back, its prevalence varies widely. This tends to develop over time rather than being caused by an injury or a trauma. Diagnosis is made by a doctor after carrying out a physical examination and advising some tests. You may be asked to walk, sit, stand and perform various other activities during the examination. The doctor may also suggest some tests and imaging studies to diagnose the problem. These can include an X-ray, MRI (Magnetic Resonance Imaging), CT scan (Computerized Tomography) or EMG (electromyography). As sciatica is caused by an underlying medical condition, treatment is targeted to address the cause rather than just giving symptomatic relief. Treatment is usually nonsurgical, primarily involving self-care. However if the pain is intractable and severe, surgery may be considered. It is advised to consult a doctor for sciatic pain before taking any treatment, so that it can be properly evaluated for any underlying serious medical issue. Improper exercised and self-medication may make the situation worse rather than causing any improvement. Regular Exercise. This can help increase the back’s strength, flexibility and make it strong. It will also help tone the muscles which are affected by poor posture. Proper posture. This one single habit can save you from acquiring a number of back problems. We have a variety of products available to help you achieve the perfect posture while sitting, driving and sleeping. Body mechanics. Prevent prolong sitting or standing. Avoid lifting heavy objects and twisting while doing so. Use support if you need to. How to Beat Sciatica Pain at Home? We at Spinal Backrack suggest “Back Decompression Therapy” to treat the causes and symptoms of sciatica at home. You don’t have to go for invasive treatments like steroid, painkillers, or surgery. Decompressing the spine treats over 90% of all back problems. Take control of your back pain with an innovative spinal treatment!